What I love about objects is how they hold stories. Even the humblest bit can resonate with meaning and memory, provoke feeling. Objects spark my writings here – mostly memoir and a little poetry – and occasionally take on a life of their own. 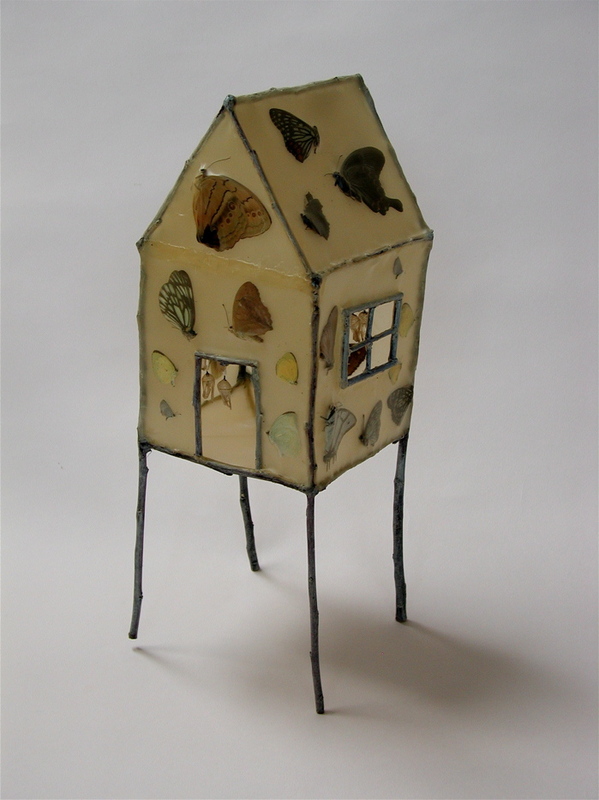 Anna Belle Kaufman: Transient Quarters, 2012, twigs, wax, butterflies. Anna Belle Kaufman is a designer, artist, art psychotherapist and smitten caretaker of two baby goats, Yankl and Yosl. Why not call yourself a writer and a poet too? I just read your robin poem “Flight” and felt as though it was written for me and about me. As I think many women would feel, if they read it. I got a lump in my throat. The lump nearly transformed itself into tears when reading “Silver dreams”. Tears came when I read “Cold Solace”. Been there too. In fact, you just reminded me that I’m still there, though I try to forget. Some would say emotional subjects like these are a cheap shortcut to making an impression. Still, if I detach myself emotionally – the way you have with words is magical. Sentence on sentence your build up inner images. Poetical ones, yet filled with thought and reflection that has transformational power. Please keep on writing. I found my way to your blog by crazy coincidence – the entry point being the image of the broken, yet mended silver heart. A banal theme, I absolutely detest, but I immediately recognized the perfectness of that little thing among hundreds of Google images. Rough yet poetic, I saw the vibrant nerve it has about it – with or without a story to accompany it. Having read the story, I sensed both the love and the agony from which it was made, and appreciated it on another level. Art psychotherapist – never knew there was such a thing, but reading your story it makes perfect sense. To cite Neil Armstrong: “what a wonderful word”… And it truly is wonderful that it has people such as yourself in it. Hi…..I, too, found this extraordinary site when I saw that silver heart while trolling for something completely different. Extraordinary writing and artwork. I’ll write more after I return to reading.